Carbon monoxide is not what is supposed to happen when a fuel such as natural gas is burned. Yet it did happen in the Wayne Michigan carbon monoxide poisoning at the Hickory Hollow Cooperative. Click here for yesterday’s blog. What should happen in a fuel burning appliance is that the fuel combines with oxygen and produces CO2 and H2O. As both gases are hot after combustion, they should harmlessly flow up and out of a chimney. But when the H20 (water) starts condensing (returning to a liquid form) before the gases leave the chimney, this is evidence that there is something wrong with either the flame inside the appliance or the method of venting. Either there is too much fuel for the amount of oxygen or the gases are being cooled by some process that shouldn’t be occurring. Negligent maintenance of appliances and chimneys can cause either process to occur. In the Wayne Michigan carbon monoxide poisoning, it appears that bad maintenance allowed both things to happen. Modern HVAC systems utilize galvanized steel exhaust pipes. At Hickory Hollow, the chimneys were brick with clay liners. But masonry chimneys are not necessarily unsafe if they have well maintained grout and are sealed to the elements. 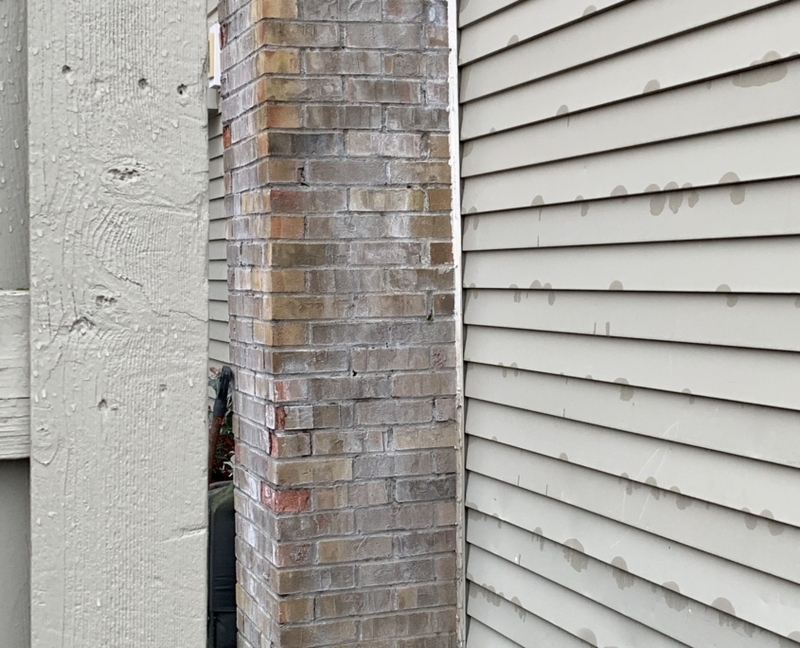 But if a chimney looks like this, it is likely that the seal between the hot gases of the chimney and the cool outside air is not maintained. Condensation marks like these found after the Wayne Michigan carbon monoxide poisoning are clear indications of bad maintenance and management. When outside air leaks into a chimney, it cools the gases. When this happens, H2O will begin to condense inside the chimney before it gets to the outside. If it is cold enough, ice could begin to form inside the chimney. If the boiler is burning hot enough, one would think it would continue to melt the ice. But even on the coldest days, boilers and furnaces don’t run continuously. Thus the ice can formed when the boiler isn’t running. If the ice formation is bad enough, it may escalate to the point that the exhaust gases can’t escape. Old chimney’s systems like the one shown here require the normal updraft of a fully open chimney flue to keep gases flowing. It is important to keep gases flowing not just to make sure they leave the building, but also to provide the pull of oxygen to the flame. When the hot air cools and thus slows down, carbon monoxide will be formed. When the amount of carbon monoxide gets to a significant level, the risk of it leaving the chimney escalates. Carbon monoxide may actually start flowing down the chimney and out into the house. The question has to be asked? Should Hickory Hollow management and maintenance personnel have had warning that this could happen? Of course they should have. This is an open and obvious hazard. When condensation marks show up on the outside of a chimney, that is a red flag. When significant rust shows up at the bottom of a chimney at the clean out, that is a serious indicator. The outside condensation can be seen in a drive-by inspection. Anyone properly trained should been warned. It would be obvious while a maintenance person was mowing the grass. While not as obvious from the street, the inside condensation marks are the type of signs that should have mandated a full inspection. But was anyone even looking? Not only does it appear that Hickory Hollow didn’t see the outside signs, but they didn’t inspect the boilers often enough to see the inside signs. The lingering question in this case is why didn’t Hickory Hollow figure out how dangerous their chimney’s were between the first time someone went to the hospital with carbon monoxide poisoning and when someone subsequently died?